Breeding and care in captivity of the Santa Cruz Garter Snake, Thamnophis atratus atratus (Kennicott, 1860). Garter snakes are very attractive and active snakes. This North American genus has many species (30 according to Rossman, Ford & Siegel, 1996) that occur from Canada to the middle of America (Honduras, El Salvador). The variation in pattern, colour, build and ecology are enormous. The most well known, most held and imported species is the Common or Eastern garter snake Thamnophis sirtalis, of which the very rare subspecies that occurs in a very small area around San Francisco (Thamnophis sirtalis tetrataenia) is world-famous. 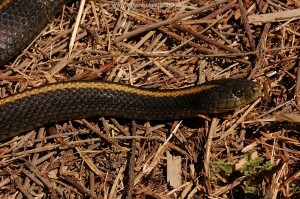 Less known but also very attractive are two species that occur more or less sympatric with the San Francisco Garter Snake (T.s.tetrataenia) in San Mateo County in California: Thamnophis elegans terrestris, the West Coast Garter Snake and Thamnophis atratus atratus, the Santa Cruz Garter Snake. T.elegans terrestis from San Mateo County, Ca. It is almost incredible that in the same area three such beautiful species of garter snakes occur simultaneously. In this article, I want to describe my experiences with the care in captivity and the breeding of the Santa Cruz Garter Snake. This species flourishes very well in captivity and is therefore very suitable for as well the beginning as the more experienced hobbyist. I hope that this article will make more people enthusiastic about this rarely kept species of garter snake and that it can serve as a guideline how to keep this species successful in captivity and how to breed it. Keeping records of measurements of the adults, timing of birth, clutch and number size etc. can generate valuable data (see the request for additional data in Rossman, Ford & Siegel, 1996) on the reproductive biology of garter snakes. In this way hobbyists can help herpetologists to interpret the data collected in the wild. In this article data on the reproductive biology of Thamnophis atratus atratus collected over the past 6 years are presented and analysed. Thamnophis atratus is a relatively large species of garter snake, that reaches a maximum length of 101.6 cm (Rossman, Ford & Siegel, 1996), but the average length of the adult snakes is approximately 60 – 80 cm. It was only in 1987 that Thamnophis atratus was recognized as a separate species. 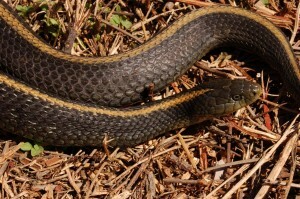 In older literature this species, together with other west coast species, was treated as a subspecies or synonym of the “catchall taxa” Thamnophis elegans, ordinoides or couchii (Rossman, Ford & Siegel, 1996). There is quit a lot of variation in pattern and colour within this species. Rossman, Ford & Siegel (1996) distinguish 2 subspecies: Thamnophis atratus atratus and T. a. hydrophilus. My animals belong to the subspecies T. a. atratus and originate from a population of which the ground colour is quite dark (nearly black) with 1 beautiful and very contrasting yellow (pale yellow to warm orange yellow) middorsal stripe and a yellow throat. Some specimens of Thamnophis atratus have 3 stripes. Recently a new subspecies has been described: T.a.zaxanthus (http://www.californiaherps.com). Thamnophis atratus atratus is quite heavily build and especially the adult women can become large. For an extensive description, I refer to the magnificent book of Rossman, Ford & Siegel (1996) and the website mentioned above. Biotope of T.a.atratus and T.elegans terrestris in San Mateo County, California. Rossman, Ford & Siegel (1996) give the following description of the habitat of Thamnophis atratus: shallow, rocky creaks and swift-flowing streams in dense-canopy oak woodlands woods and grassy woodland ecotones. When they occur in ponds with muddy bottom there are generally rocky outcrops in the vicinity. Open basking areas along the river banks are very important. The species occurs along the coastal area of southern Oregon in the north to the middle of California (Santa Barbara County) in the south. Personal observations on this highly aquatische species in their natural habitat have been described in Bol (2002). As a minimum requirement for the size of the terrarium to keep 1 or 2 adult couples of this species I recommend 65 x 50 x 50 cm (L x W x H). I have kept these snakes in both all-glass as wooden (with a glass front) terrarium. For the proper care of this species some things need extra attention. The terrarium must be well ventilated, the land part must be completely dry and the right temperature range must be created. For ventilation I use generous strips of wire mesh in the lid (asymmetrical) with a maximum of 20% of the surface. The terrarium gets cleaned and disinfected at least 1 – 2 per year. This species will probably thrive in a natural habitat terrarium with a large water bowl in which one offer can live fish. For heating and illuminating the terrarium I use a light bulb (normal or reflected) of 15 – 75 Watt depending on the snake room temperature. The bulb is placed in a corner of the terrarium and some branches allow the snakes to bask right under the bulb. I always try to create a temperature range with a warm corner of at least 30 – 35 °C and a cool corner of 20 – 24 °C during daytime. The combination of ample ventilation (asymmetrical), sufficient terrarium volume (not too small or too low) and a light bulb high in the least ventilated corner of the terrarium automatically creates a temperature range! Noteworthy is the fact that all of my terrariums are placed in a not-heated attic room. In the winter months the temperature in this room fluctuates from 8 – 12 °C during night time and to 10 – 15 °C during daytime. When outside temperatures rise the snake room temperatures rise as well. During summertime temperatures can rise up to at least 30 °C and higher. In the beginning of 2005 I started to use a thermostat that shuts down the bulbs (and the heating inside the terrariums) as soon as the room temperature rises above a particular threshold. As threshold I mostly use 24 – 26 °C, in order to prevent that the temperature in the terrarium rises too far. Before 2005 this was regulated by “gut feeling”; when warm summer days were expected I shut down all lighting/heating early morning (see “problems and illnesses”). Except during the hibernation period (see hibernation) the bulbs are switched on from 8 AM until 9 PM with little variation of the “day length” during the season. At nights all lights (heating) are shut off which causes the terrarium temperature to drop to the snake room temperature: 10 – 12 °C in the early spring (February/March /April) to 18 – 25 °C during the warmer months of the year. Preferred body temperatures of most garter snakes are estimated somewhere between 26 – 32 °C (Rossman, Ford & Siegel, 1996), and a temperature range allows snakes to regulate their own body temperature just like in the wild. Observing the behaviour of the snakes also can gives you indications whether you have created the right temperature range: when T.a.atratus does not bask on the warm spot and hides itself is the whole day then the temperature is most likely too cold (and they sort of expand the hibernation period in the heated terrarium) or too hot (so they look for the coolest place in the terrarium which is most likely ion the coolest corner under rocks or debris). The ideal behaviour I like to observe is that within 1 – 2 hours after the bulbs are switched on the snakes will start basking on the warm spot and later during the day they will continue basking a little further away from the hot spot or even totally hide themselves. This observation combined with regular feeding behaviour of the snakes and a cool spot which not warmer than 25 – 28 °C maximum (colder is not problem)gives me the conviction that I have created the right temperature range. In my experience T. a. atratus is a species that likes relative high temperatures and I have the impression that their preferred body temperature may even be slightly higher then 32 °C. 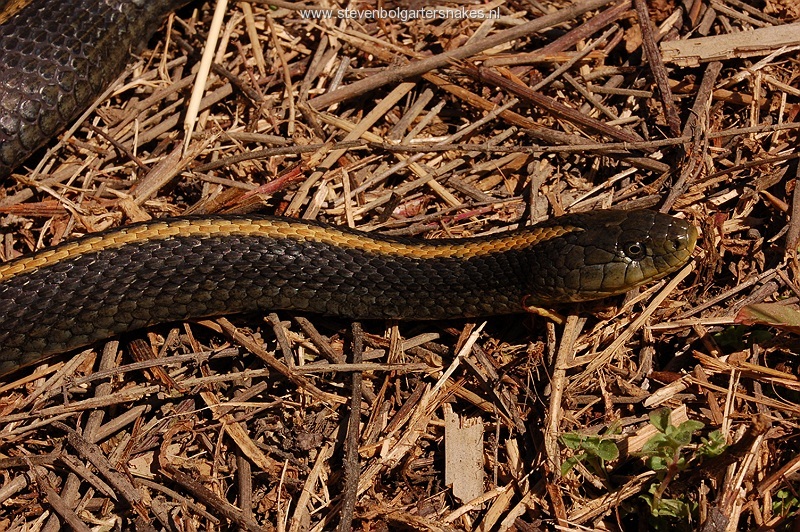 I have seen the snakes, especially in early spring, basking on the hottest spot in the terrarium and it was not until the temperature rose locally above the 35 °C that the snakes started to bask slightly further from the hottest spot. The Californian Coast is climatically strongly influenced by the Pacific Ocean. Due to the southern latitude de radiation of the sun is very intense, but during wintertime their will be long periods with rainy/cloudy/foggy weather during which it will be too cold for the Santa Cruz Garter Snakes to remain active. In literature is written that snakes can be seen on mild winter days, but that does not exclude a hibernation period. Especially the coastal strip of California is foggy and cloudy. Middle March 2003 I visited the natural habitat of this species in California: The weather was rainy and foggy and temperatures were around the 10°C. Between noon and 2 PM when the sun tried to peak through the clouds limited activity of Thamnophis atratus could be noted. Two snakes were sunning themselves. It was clearly mating season for the amphibians (Tree frogs, Hyla spp. 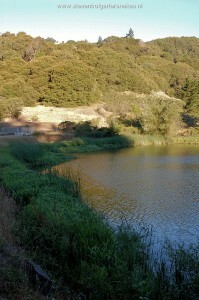 and Taricha torosa, The Californian Newt) and the first willow trees just started to turn green. These observations so “late” in spring gave me the impression that this species does hibernate during wintertime. I hibernate my snakes for approximately 3,5 month (15 weeks) starting early November and ending end of February. I do this for the following reasons: keeping the snakes in a way that closely resembles the natural situation and breeding them according a planned method. For more details about the material and methods of the hibernation please read Bol (2004). Minimal 1,5 – 2 weeks before the start of the hibernation (early November) the snakes are offered food for the last time but I keep the terrarium well heated so that it no undigested food remnants stay behind in the intestine channel. Then I switch off the lamps/heating. The animals remain then in the unheated snakes room by temperatures that in this time roughly fluctuate between 8 – 12°C. During periods with severe frost the temperature can get as low as 2 to 4°C, and on soft sunny days the temperature may occasionally rise up to 14 to 16°C (only for a few hour in the afternoon). After a short period in the unheated terrarium (at most four weeks, mostly shorter), I place the snakes in a hibernation box. I use for this metal (old cake drum) or plastic containers (relative small: content approximately 3 – 5 liter) with limited ventilation capacity created by some holes in the lid. This is of essential, since garter snakes are prone to dehydration during the hibernation, especially in the fridge. The containers are filled for two third with a mixture of sawdust and damp leaf (normally from the garden, no need for disinfection ), and I make sure the substrate is slightly humid by sprinkling water over it. As long as the insides of the lid contains some water droplets due to condensation I consider the substrate to be damp enough, otherwise I sprinkle some extra water. In this way the snakes hibernate, without water tanks, in the containers in the unheated snake room. I check approximately once per month to see if the snakes are OK. Often the animals lie on the substrate or they have crawled away in the substrate. After opening the box the snakes react by tasting the air with their tongues or possibly slowly crawling around. My experience is that as long as the substrate is damp enough the snakes survive this hibernation period of 3.5 month easily, hardly lose any weight (maximum 3 – 5% weights loss, average in 2006 was 0,8%) and they still are in perfect shape after the hibernation period. I have never seen any problems with a substrate which was too damp, aside from a small spot on the skin (blister) that was slightly inflamed. But after the snakes have shed their skins for the first times these blisters normally vanish. Over the past six year that I have hibernated this species in this way not a single one died. Also young snakes, which usually are a few months old in November, hibernate in the same way as the adult animals (in the wild these young snakes also do not receive a special treatment). The only difference is that the duration is shorter: a minimum of eight, at most eleven weeks. The snakes are placed back after the hibernation, mostly around end of February, in the heated terrarium. 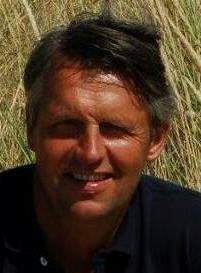 A transitions period is not created and from the first day onwards I try to create a warm spot locally of 30 – 35°C. Usually the snakes react by sunning themselves almost the whole day directly underneath the lamp. In the nature these transitions also do not occur gradually. ROSSMAN, FORD & SIEGEL (1996) give an excellent example of the daily fluctuations in the body temperature of a Thamnophis elegans in California in April. During a cold night the snake has a body temperature of 8°C (from 6 o’clock in the evening until 9 o’clock in the morning), after which it rises rapidly, under the influence of the powerful sun, to a maximum of 25°C around 12 o’clock at noon. Around 3 o’clock in the afternoon the body temperature is still 20°C after which it drops gradually to 8°C. Mating behavior starts almost immediately after ending the hibernation (when the terrarium warm is enough) and during the first weeks the males hardly leave the side of the female. Mating behavior can sometimes be observed for days or weeks in a row (until end of March). The male lies on top of the female and attempts to curl his tail underneath and around the tail of the female. Heavy shocks run through the body of the male. I do not separate the sexes during the year; males and females live year-round in the same cage. Keeping the snakes separate in order to stimulate mating behavior is absolutely not necessary in my opinion. The only disadvantage of keeping the snakes together is that it diminishes the chance of witnessing a real mating so you are never 100 % sure whether the snakes have mated successfully. I have observed successful mating of this species within 10 – 21 days after the hibernation (long before the first shedding). Mating behavior in fall and after giving birth is very common. This is in contradiction with Rossman, Ford & Siegel (1996) who mention a case of fall mating as an exceptional observation. Observing this in the wild may be exceptional, and this is an example how keeping snakes in captivity can contribute to the knowledge about the biology of a species. 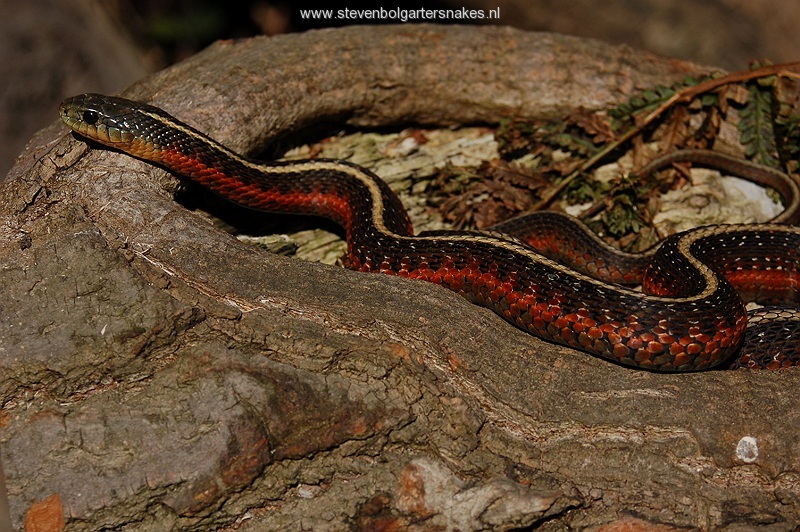 Within 1-2 weeks after hibernation the Santa Cruz Garter Snake can start to feed in captivity. When the terrarium is (too) cool the snakes may refuse to eat for several weeks. The first meals may be moderate. But soon the snakes (especially the females which are pregnant) become very hungry. Early to middle April the females are noticeably pregnant, and the skin between the scales remains clearly visible even several days after feeding. In captivity the Santa Cruz Garter Snake shed it’s skin relatively late: the first shedding usually occurs 7,5-11 weeks after the hibernation has ended. This is mostly around end of April-beginning of May, much later then some other species of Garter Snakes like Thamnophis sirtalis spp. This is why I consider a method which is often used to stimulate mating unsuitable: putting the snakes together after the snakes have shed their skins for the 1st time. Normally the snakes are noticeably pregnant around this time. The snakes are offered a diet of almost exclusively fish. Smelt, Barbus spp. and other (mostly freshwater) fish species. Only in 2004 I offered quit a lot of mice (dead, thawed), because the limited availability of smelt from Holland. But I the snakes received the mice always together with fish. Thamnophis atratus accepts mice quit easily specially when scented with fish. The snakes are fed every five to seven days and they can eat a s much as they want. The (thawed) fish are offered on a small plate in the terrarium mostly in the evening. I remove the fish the following day. 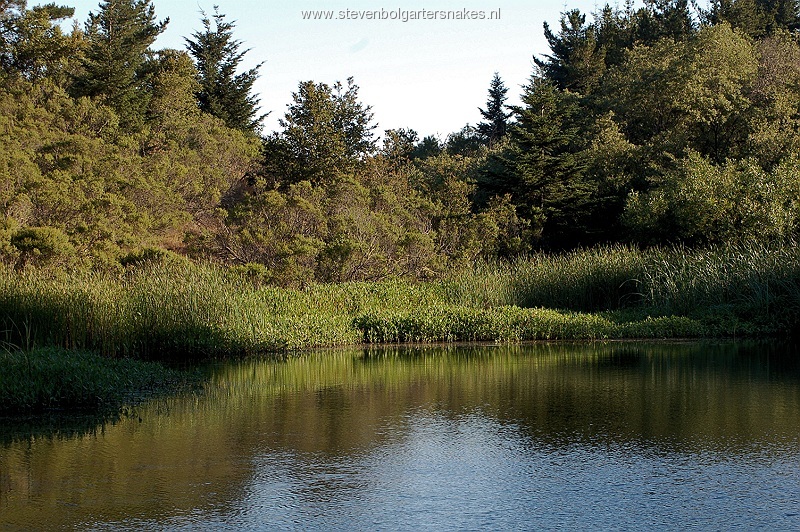 Because the Santa Cruz Garter Snakes (especially pregnant females early spring time) react quit hungry and aggressively to fish it is wise to remain present while they are eating to prevent that 2 snakes start eating the same fish. The much smaller male (including fish) could easily end up in the stomach of the much bigger female. Especially when you keep a group of 10 -20 young snakes in the same cage this can happen easily. To prevent a deficiency of Thiamine (Vitamin B1; see Zwart 1982) I add several droplets of vitamin B1 every time if feed them. Multivitamins (mostly Nekton Rep) I add only once every 1 – 2 month. Thamnophis atratus is a heavily built and large Garter Snake which can get fat quit easily. Do not feed them too often, especially when they receive a lot of mice. Life fish are hardly given, but that is more because of practical constraints. Sometimes I give the young snakes life fish to stimulate them to start feeding. They respond very well to it. In the wild the diet consists beside fish of amphibians like frogs, toads and newts (Rossman, Ford & Siegel, 1996). But I never give them amphibians (sine they are protected in Holland). In literature worms and slugs are not mentioned as part of their diet. In their natural habitat in early spring worms are abundant (personal observation) and I do expect they will eat worms. When the snakes are kept as described above it becomes obvious that the snakes are pregnant as early as April. The females are extremely voracious in this time of the year and they are sunning themselves all the time. Only in the last few weeks prior to parturition the appetite of the female starts to slow down although they usually never stop feeding completely. Thamnophis atratus is oviparous just like all the other garter snake species. The young are born between end of June and end of July in my terrarium. 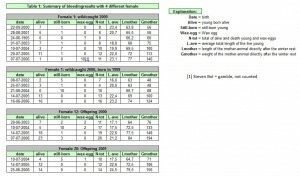 Table 1 shows an overview of the breeding results with 4 different females in the years 2000 – 2006. In the wild average litter size is 7,8 and 8,4 according to Rossman, Ford & Siegel (1996). In 2005 the 4 females gave birth to 56 young, of which 2 were dead. The average number of young in 2005 (fourteen) is above the average mentioned in literature, but my females are all fairly big (69 – 77,5 cm, see table 1) and well nourished. A 6 year old female of 84 cm gave birth of 26 (23 alive, 3 born dead) young in July 2006. In general larger, heavier and older females have larger litters then smaller females. 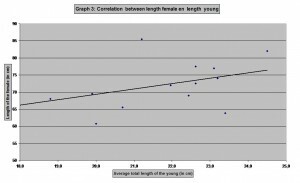 Graph 4 shows the relation between the total length of the females and number of young per litter. This graph 4 shows that length of female and litter size (including wax-eggs (the orange-coloured infertile eggs) and dead-born young) are strongly correlated. The total length (measured right after birth) of the young of the 4 litters from 2005 (2 females gave birth at the same time in the same terrarium, so these young are treated as one litter) averaged 22,0 cm, 22,4 cm and 22,6 cm, which is larger the data from a female from Stanislaus Co., Ca. (18,7 – 20,9 cm): Rossman, Ford & Siegel (1996)The table in Rossman, Ford & Siegel (1996) mentioned a length which is very likely a mistake: the snout-vent length for newborn males and females is stated as 99,1 and 100,4 mm . The average snout-vent length of the 4 litters in 2005 mentioned above was 16,7 cm, 17,1 cm and 17,2 cm which is also longer then the data mentioned by Rossman, Siegel & Ford (1996) in the species description: 12,6 to 16,6 cm. The smallest young in the 4 litters from 2005 measured 20,1 cm; the largest 27,3 cm (total length). 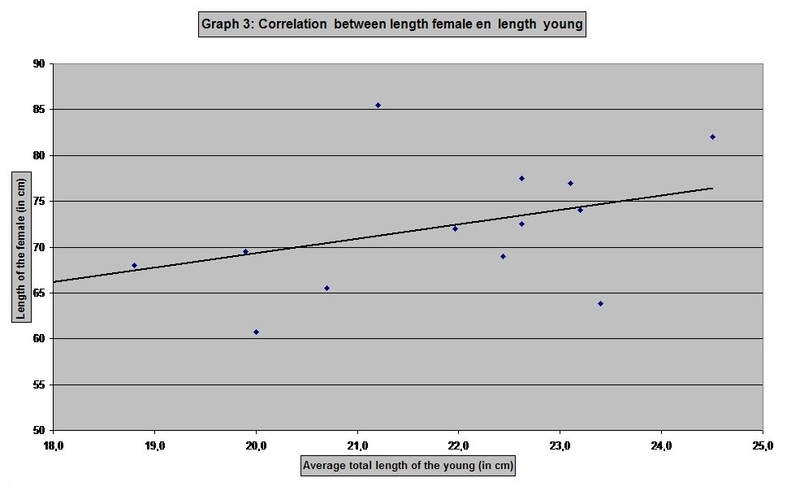 Graph 3 shows the correlation between the length of the female and the average length of the young. 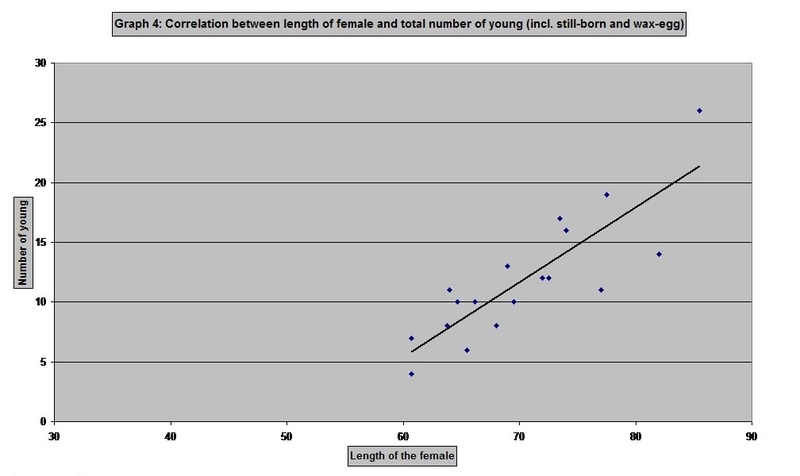 These 2 parameters are not correlated as clearly as the length versus the number of young. I think the temperature plays an important role in this (see the chapter “problems and diseases”). Normally I offer the babies food for the 1st time after a few days to a week. The diet consists of fish, just like the parents. Ideally the size of the fish is chosen so that the widest part of the fish is slightly wider then the head of the baby snakes (so they can eat it just barely at once). Other wise I cut the fish in small pieces (including scales, intestine and bones). They are offered more food then they can eat within 12 hours, and normally the following day or morning the left over’s are removed. Food is offered every 5 – 7 days. In the last years raising the young has been without problems (see chapter “problems and diseases”). 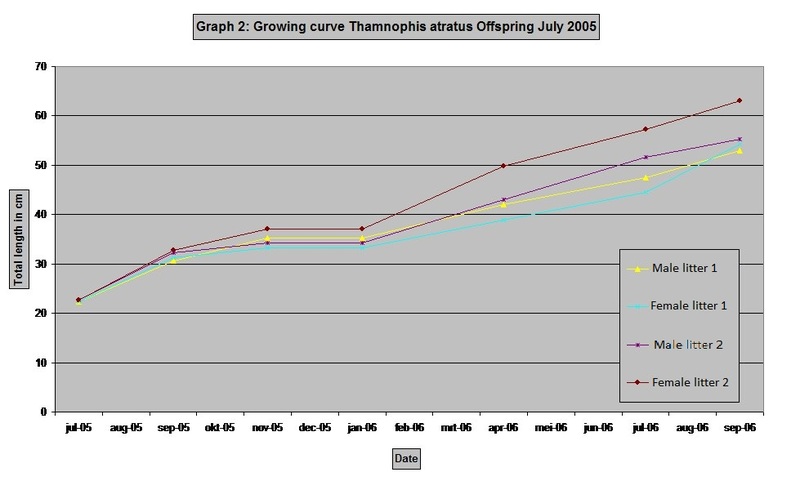 Graph 1 shows the growth of some (offspring and wild caught) snakes born in 1999, 2000 en 2001. The oldest female of known age is 7,5 years old (February 2007; female # 3) and measures 81 cm. The other females (female # 12 & 20) measured at the age of 5,5 years 84 cm and female # 12 measured 87 cm at the age of 6,5 years (January 2007). The maximum length of Thamnophis atratus recorded in the wild is 101,6 cm (Rossman, Ford & Siegel,1996). The largest female I have ever seen in California measured 78 cm . 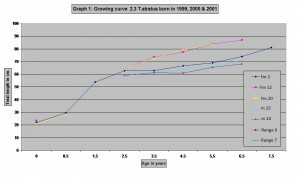 Two males born in 2000 measured 71 and 68,2 cm at the age of 6,5 years. The largest males I have seen in California measured 78 cm. 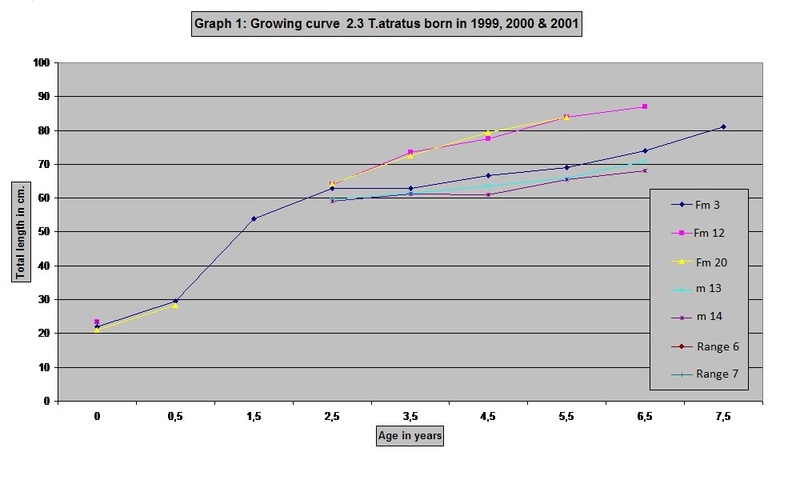 Graph 2 shows the growth of 2 litters born in 2005. These results show that growth speed can vary a lot. The litters of 2005 consisted of large and healthy young. This in combination with high quality food ( high quality Barbus spp. versus smelt of sometimes questionable, dehydrated quality) and a terrarium which is sufficiently warm can create an enormous growing speed. It is never my goal to let baby snakes grow as fast as possible and I never feed the babies more then every 3 – 7 days. 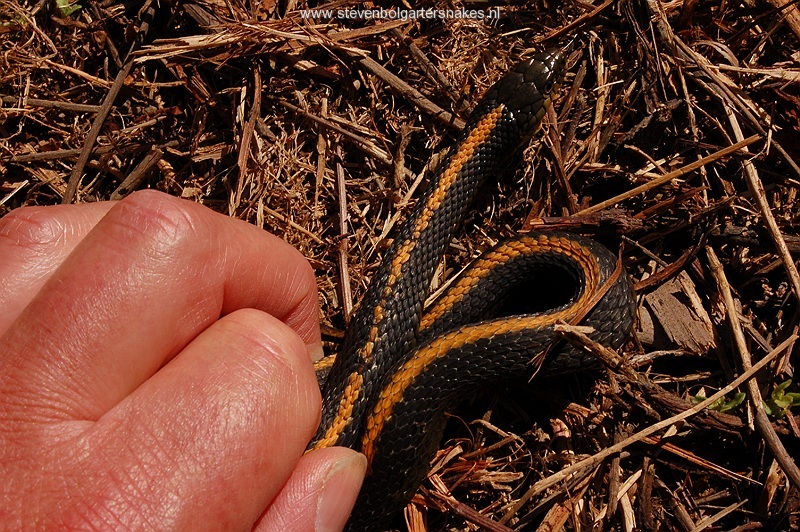 Despite of this the snakes of the 2005 litter grew fast: the largest females measured appr. 60 cm and the largest males appr. 50 cm after one year (including a hibernation!). Graph 2 also shows that the growing speeds of the males and females do not differ much in the 1st year, although the growing speed of the females from litter 2 exceeded both litters of males. As I have described previously the oldest female (with known birth date) in my collection is currently over 8 years old (September 2007). A couple of Thamnophis atratus which must have been at least 3 years old in 2000 have celebrated their 10th anniversary this year in the summer of 2007 and both are still very healthy and vigorous and reproducing. All three females of exactly known age in my collection gave birth to their 1st young at the age of 3 years which means that they were sexually mature at the age of 2,5 years, directly after hibernation. At that time their length was 63, 64 and 64,7 cm. When we compare this minimum length for sexual maturity with the females born in 2005 (graph 2) this may mean that some snakes can reach sexual maturity within 1,5 years. Those females could probably produce their 1st litters at the age of 2 years. Rossman, Siegel & Ford (1996) recorded as the smallest size for sexual maturity in females 38,6 cm snout-vent length (or 47 – 48 cm. total length). The youngest age where I observed mating behaviour in a male was a little over 1,2 years (in the fall). The male measured at that moment 60,3 cm total length. Over the past 7 years of keeping Thamnophis atratus I have not had many problems. Some things are worth mentioning though. The first 2 years I kept the snakes in a large terrarium in which I tried to simulate the natural habitat. The snakes did not thrive very well, ate insufficient amounts of food and where rarely visible. Looking backwards I think that the terrarium was too cold in the spring and fall: a combination of a large size (150 x 50 x 90 cm lxwxh), abundant ventilation and limited strength of the light bulbs. The poor circumstances may have increased the number of Flagellates, so I treated the snakes with FLAGYL (200 mg/ kg body mass, given oral twice with a ten day interval). After the snakes have moved too smaller and warmer terrariums limited appetite has not been an issue anymore and none of my snakes showed signs of mall nourishment. The fact that my snake room is strongly influenced by outdoor temperatures makes simulating the temperatures as they are in spring in their natural habitat fairly easy: With strong light bulbs (since room temperatures are low early spring) the daytime temperatures rises sufficiently whereas the night temperatures drop down significantly. After the hibernation the behaviour of the snakes is observed closely: are they sunning themselves regularly, have they started mating and are they feeding well. If this was the case I usually did not measure the temperatures anymore in the past . And this created a potential problem! The strong (60-75 watts) light bulbs, needed to heat up the terrarium early spring, were usually not replaced until they broke down or until I really noticed that temperatures got too high. I never measured the terrarium temperatures later in spring and summer so I do not have precise data. But over the years it slowly started to realise that I had a problem with temperatures rising too much inside the terrarium in the summer. Every now and then I did switch off the lights when high outside temperatures were expected, but there were several warm days were I forgot to do this. Or the temperatures rose unexpectedly, or I had not observed the weather forecast. As I explained before the snakes moved to a smaller terrarium in 2002 after being in the large habitat terrarium for 2 years. Table 1 shows that the breeding results of 2002, 2003 and 2004 were quit poor: 2002; 7 young born from 2 females, of which 5 were born dead (71 %), 2003; 22 young from 3 females of which 4 were born dead (18%) and in 2004; 44 young from 4 females of which 32 (72 %) were born dead. The results of 2004 were so obvious and disappointing that I realised something was wrong. I measured the temperatures at the coolest spot in the terrarium right after birth which was as high as 35 – 37 °C on some warmer days (room temperatures 31 °C). A very stupid mistake! Over the years I had emphasised on higher temperatures in early spring to get the snakes started but forgot to slow down in late spring/early summer. The high % of well developed but dead born young was not the only result I have observed due too high temperatures during the pregnancy of the females. 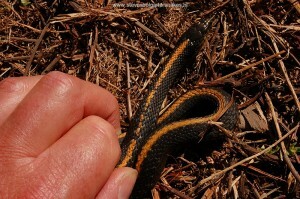 The young were relatively small (see table 1: 18,2 cm on average), a phenomena previously recorded in egg laying snakes with too high incubation temperatures. A large number of young had a curly tail tip (similar to the tail of a pig). A large number of snakes showed increased melanism. The “pig-tails”, increased melanism and high number of still born young was also observed in Thamnophis sirtalis tetrataenia which was housed together with Thamnophis atratus. Based on these facts I conclude that too high temperatures in the (in this case) last part of the pregnancy can lead to a high percentage of dead born young, smaller young, increased melanism and the occurrence of a “pig tail”. As far as I know this has not been described previously in literature. I do realise that other factors can play a result since I have not done real trials to confirm my suspicions under controlled circumstances. 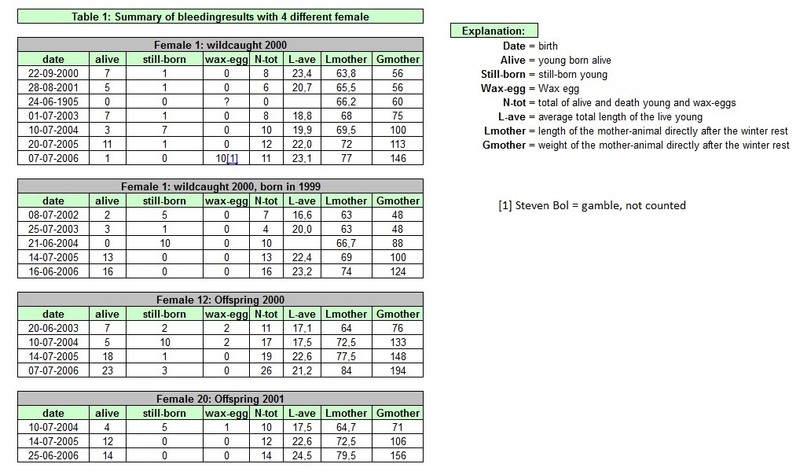 Looking at the breeding results (table 1) the effects of a better temperature management seem obvious: in 2005; 56 young from 4 females of which 2 were born dead (3,5 %) and no “wax eggs”; in 2006; 57 young of which 3 were born dead (5,2 %) and no “wax-eggs”. The average length was 22,7 cm and not a single baby with a “pig tail”. Thamnophis atratus is a very attractive species. They are diurnal and because of that they are easily visible in the terrarium every day. They have no problems feeding and accept a wide range of food, are relatively quiet and relatively easy to breed. Because of these facts it is a very nice garter snake species to keep and raise in captivity. They are both interesting for the more experienced hobbyist as for a new starter. With this article I hope to make this unknown species more well known. When the suggestions and recommendations described in this article are followed I expect that everybody who acquires healthy specimens will enjoy this species a lot and will be able to reproduce them successfully. Breeding and care in captivity of the Santa Cruz Gartersnake, Thamnophis atratus atratus (Kennicott, 1860). 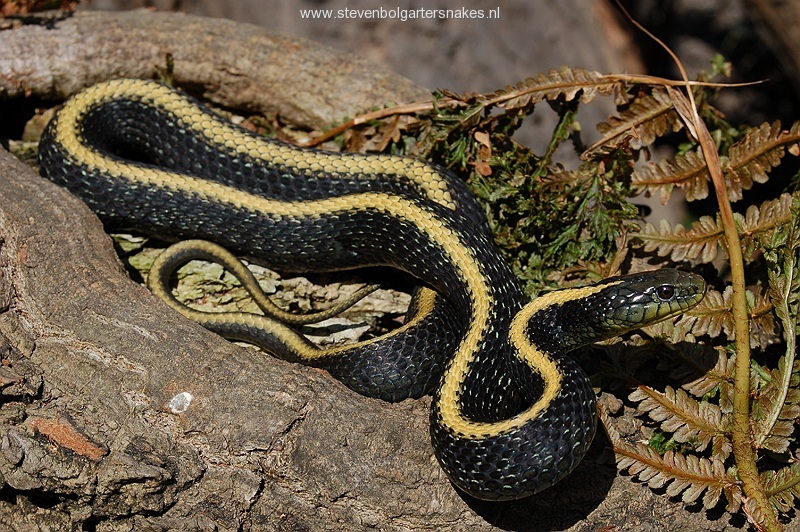 In this article an unknown gartersnake is introduced: Thamnophis atratus atratus. After a short description of the animals and their natural habitat the author discusses the husbandry of this species. The requirements of the terrarium are described extensively. The author considers hibernation essential for keeping this species true to nature and for systematically breeding these animals. Also newly-born animals hibernate at an age of five months. The active season following the hibernation and the reproduction is described and some data accumulated in the last six years are analyzed. The data on growth of several individuals are given, as is the variation throughout the years. Remarks are made concerning age and length when reaching sexual maturity. Finally some notes are given to problems and diseases with this species. An, until now in the literature never described, effect of keeping the animals too warm during pregnancy (percentage still-born, length of the juveniles, “pig-tails” and colour) is described.